With the launch of iPad, tablets became extremely popular and widely used. Tablets combine the ease of use with amazing feature, thus making them highly desirable. Within the past two years we have seen a huge boost in the tablet industry with different manufacturers releasing their own tablets. We have seen Windows 8 tablets, Android tablets and iPad etc, each having its own pros and cons. Android tablets have gained popularity and now a huge amount of different types of these tablets are available out there. Finding wholesale tablets is also very easy for those looking to save big. Many different companies manufacture Android apps and have price ranges from being inexpensive to being quite expensive, and all are unique in their own way. The number of apps designed for Android is huge but it is as big as compared to iPad, which boasts 300000 + apps, but still Android has got some good apps to offer including a Showbox App Update. If you are looking for some really cool apps to take advantage on your Android tablets, then you are at the right place as today we have for you a list of 10 Essential Apps for Your Android Tablets. These are must have apps for everyone and will surely make your life easier and fun. So check them out and pick the ones you like the best. Google Chrome is one of the most popular, widely used and loved web browser and is available for multiple platforms. It is easy to use, offers some really cool features and is very reliable. It offers quick browsing, fast page loading, and you can scroll and zoom in the pages using Chrome. You can sign in for syncing your Chrome browser from your PC to take advantage of it everywhere with you. Pocket was previously known as ‘Read it Later.’ It is a really nice bookmarking service that allows you to save links so that you can read them later when you have time. It has the ability of automatically syncing with your phone, tablet or PC so as to allow viewing the document even when offline. Android Photoshop, the most amazing photo editor and graphics software available on the web, needs no introduction. Adobe Photoshop Touch app offers amazing Adobe Photoshop features such as layers, selection tools, adjustments, and filters on your tablets and allows combining images, applying professional effects, sharing your creations people via Facebook and Twitter. This one is a really cool photo app for your Android tablet and once you have it, you won’t have to look for any other. This app helps you spice up your photos and enhace their look easily and quickly. It allows transforming and sharing your photos in a hassle-free way. Google Drive needs no introduction as it is one of the most popular and widely used cloud storage services. It provides you with a 5GB of free cloud storage which allows you to keep your files safe and makes accessing it and sharing them with others from anywhere possible. Google Drive Android app can be used for accessing all your files such as pictures, documents, videos etc saved on Google Drive. 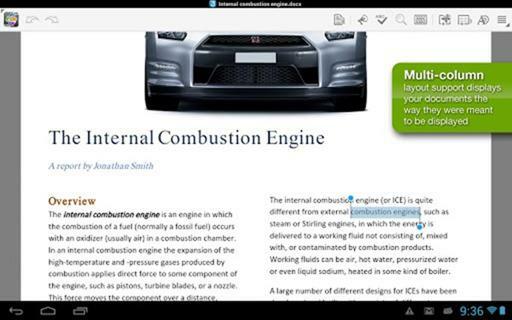 Quickoffice Pro HD is an all in one app for working and managing your documents. It allows working online and offline. You can edit Microsoft Office documents, spreadsheets, and presentations easily and quickly and annotate PDF files too. It even allows accessing your Google Drive or other such services and managing files there. If you are a Twitter user than this app is especially for you as it boasts a handy and beautiful UI, amazing animations, fast loading and awesome features, thus combining all you can wish for in a single app. As the name suggests, this app is a really efficient launcher app. It allows customizing your home screen such as grid size and up to nine homescreens, scrollable dock with up to seven icons/page and up to five pages, and offers infinite and elastic scrolling. It boasts some beautiful transition effects such as tablet, cube and many more. This app is a must have for people who like to read. It provides you with more than a million books, magazines, newspapers and other reading materials. So it is nothing less than a blessing for avid readers. You can take advantage of it without even owning a Kindle, thanks to your Android tablet! Skype is the best and the most popular app for voice and video calling your loved ones all around the world as it is free, easy to use and efficient. You can also take advantage of this awesome service on your tablets, thanks to their awesome Android app! I haven’t known about Photoshop Android app, from this I would say skype, chrome and gdrive are necessary. With so many apps available, it is really a headache which ones are the best. The must-have to me are the Google Chrome and Skype.